Part 1/4 in a S.W.O.T. series. 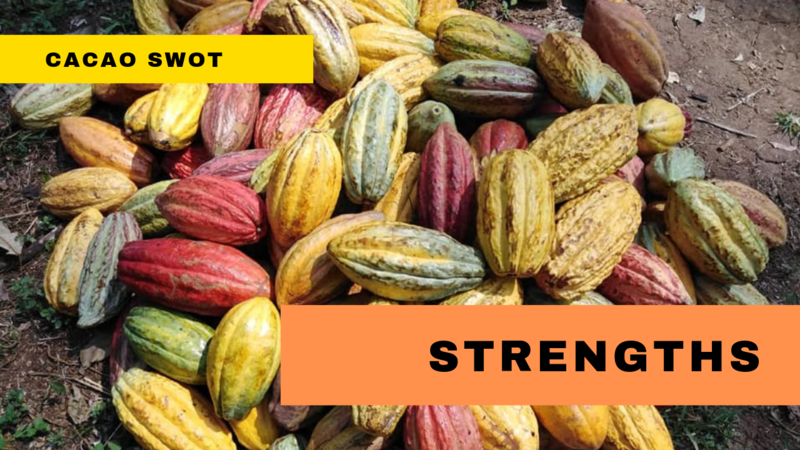 From Greek mind experiments to modern economic theory, this series explores the SWOT of cacao growing with a first focus on STRENGTHS. From agroforestry, to conflict-resolution, disaster reduction and diversity one can reframe beliefs and expectations of the amazing theobroma cacao. Years ago when teaching chefs about cacao so they could create beautiful pastry and chocolate expressions, I used to tell them how cacao was a diva and liked hats and shoes as her accessory. It was meant to bring over the role of top and understory in the cacao plantation and give rise to the understanding of nuances which can come into a crop from agroforestry methods and conservation agriculture. When an Italian chocolate company (Utomo, Prawoto et al. 2016) applied cradle-to-gate type of Life Cycle Assessment based on ISO 14040 and 14044 and researched cacao agroforestry (defined in this context as raw and sequential of cocoa/coconut and cocoa/rubber agroforestry, combined with shading trees Leucaena sp. and Gliricidia sepium) and found that for a single metric tonne of cacao pods, the cocoa and coconut agroforestry combination both yielded the lowest carbon footprint (global warming, acidification and eutrophication) while adding the most value to the soil quality (organic carbon and soil organic matter). Certainly in our experience on plantation coconut has been a wonderful ‘hat’ for cacao as it rises strongly over the top story and weathers storms relatively well (certainly in comparison to younger rubber trees). While I personally think that ‘coconut hats’ are a great accessory in fashion and in plantation, the research team from Utomo also found that coconut and cacao combinations yielded the best cacao pod volume and thus was considered to be a strong environmentally sustainable cacao cultivation method. Generating a low environmental footprint and producing great yield, in this geography at this time. A great sign of strength and reasoning for testing and trying unique plant combinations when creating sustainable cacao farms. Juan Carlos Suárez, Marie Ange Ngo and team in 2018 conducted heart-felt research that demonstrated how cacao cultivation and farming can contribute positively in post-conflict resolution in certain geographies. In the context of Columbia, the team made the case for how cacao, as a legal crop, can be one to replace illegal crops and thus be part of a tool set for peace. This very much makes one take a step back and consider Muriel Rukeyser’s statement : The ‘universe is made of stories, not atoms’. Since the Sendai Framework on disaster prevention and risk reduction (Aitsi-selmi 2015) it was a good reminder to be more prepared for abrupt-adverse weather and land shifts. The FAO 2016 reported in 2016 the news that preparedness towards adverse weather effects can prevent disaster-related crop losses (e.g., polypropylene bag and tarpaulin sheet distribution) which can prepare farmers for expected flooding. And thus a strength of cacao farming and being prepared for climate both makes us consider to have our farm-ready, as well as people-ready for when disaster evolves our home plantations. Taking a Taleb-like ‘antifragility’ approach which is less about prediction and more about working on the convexity and sensitivity to the (potential) disaster. While conservation agriculture suggests diversification for environmental reasons there are economic advantages as well. Mofya-Mukuka and Hichaambwa found that crop diversification had a notable positive and significant impact on farm income (however not directly on household income) and food security (Months of Household Adequate Food Provisions) asserting that a diverse crop is important contribution to livelihood and food security in Zambia from 2 nationally-representative surveys of rural farmers. One could consider the ‘strength’ of a cacao plantation to be in this context, it’s diversity. In a speech at the British Association 1900 for the Advancement of Science Lord Kelvin stated: "There is nothing new to be discovered in physics now. All that remains is more and more precise measurement." Soon after, Einstein unveiled his exciting new theories to once again, encourage us to rediscover physics, and reminding us to question old beliefs. One of the weaknesses in cacao is a belief that more land and more trees are the way to increase income in cacao, which one could say has contributed to deforestation. A strength of cacao is to tip this on the head and remember that there is always new discoveries, even in old commodities. The strength in global agriculture, food security and nutrition is exactly in it’s ability to evolve. While commodity crops have a dark past, they have a strong opportunity to enjoy a positive future. When Plutarch created ‘The Ship of Theseus’ a simple thought experiment about the evolution of mindset, it made me think about how our orientation of cacao farming is also evolving, plank by plank. Plutarch created an image of ‘Theseus’ the king of then-idealised-Athens, who sailed home after a successful battle on Crete. To celebrate his success, the town maintained his ship to continue the memory of the once epic and extraordinary battle. However over time, the boat became unstable and needed to have parts replaced, and the ropes, sails and planks were needed to be replaced with new ones; to keep the old image alive. Plutarch then asked, is this the same ship which should be celebrated ? Or has it evolved beyond recognition? It is a great reminder that over time, our old habits and beliefs can morph into a new form and end up not having an atom of the old approach left. In fact, we can abandon the old ship and memory for a new one that might serve our current state better. When we look at the strengths of cacao farming we need to see the opportunity for the millions of cacao farmers who seek a better living income, land which can be carefully worked and families to evolve celebrations around cacao harvest, and then chocolate enjoyment. I propose that we hold in mind what we love about cacao and chocolate, and through our habits, beliefs and ideas, science, economics and decisions to evolve beyond recognition the old form which contributed to poverty and land degradation and consider the strengths of what it can remind us to do for agroforestry, conflict - resolution, disaster risk reduction and diversification. Read the next part of our SWOT here - Weaknesses. Aitsi-selmi, A. E., Shinichi; Sasaki, Hiroyuki; Wannous, Chadia; Murray, Virginia. (2015). "The Sendai Framework for Disaster Risk Reduction: Renewing the Global Commitment to People's Resilience, Health, and Well-being." International Journal of Disaster Risk Science 6(Issue 2): 164-176. (2016). "Investment in early warning – early actions reaps massive reward against El Niño flood threats " Retrieved 13 March 2019, 2019. Juan Carlos Suárez, S., B. Marie Ange Ngo, L. M. Melgarejo, A. D. R. Julio and F. Casanoves (2018). "First typology of cacao (Theobroma cacao L.) systems in Colombian Amazonia, based on tree species richness, canopy structure and light availability." e0191003. Mofya-Mukuka, R. and M. Hichaambwa (2018). "Livelihood effects of crop diversification: a panel data analysis of rural farm households in Zambia." Food Security. Gander, C. (2013). Muriel Rukeyser and Documentary: The Poetics of Connection. Edinburgh University Press. Taleb NN, Douady R. Mathematical definition, mapping, and detection of (anti)fragility. IDEAS Working Paper Series from RePEc. 2014.